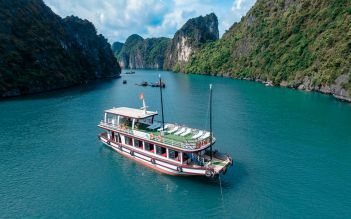 Here we board on deluxe Stellar for a trip through the magical seascape of Halong Bay where you will have the opportunity to kayak around these impressive islands. You’ll have plenty of optional activities to keep you busy, from swimming, kayaking to trying out night fishing. A visit to floating fishing village provides insight into local life on the water! With majestic sunsets on offer, you can’t beat an overnight stay on this stylish junk. Went for 2 days/1 night cruise on "Stellar" ship. Amazing experience- different kind of activities- kayaking, hiking, squid fishing and more, we enjoyed every. Guide Dien Nguyen did his job amazingly with great knowledge and his good sense of houmor cheered up everyone at any time! What can be better combination than knowledge and humour? 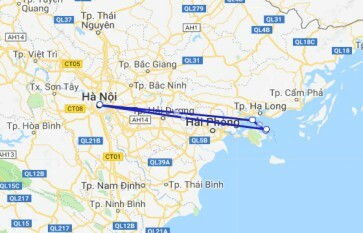 :) Enjoy Your trip! Just a perfect tour, with the perfect view, with the perfect tour guide. Let's focus on that at start: Tãm was our tour guide. She was the most attentious, funny, amazing story teller, history and mithology knower, that a guy can have. Me and my girlfriend were intoxicated by her simpathy. Adorable. The Stellar boat was perfect as also. Very very clean, very organized, under the comand of cruise manager Mr Thao. Our room was amazing! We booked the room with the small private balcony, and oh my god. The food wow. Just wow. Taste everything that they give you. No second thoughts. Just do it. The rest of the tour is wonderful, once again. The caves, the fishing floating Village, the row boat trip, the squid fishing. I highly recomend it. If you have the chance, travel with Thao in the Stellar, and ask for Tâm to be your guide. We took a 1 night/2 day cruise with A Class, on the Stellar with Duke as our tour guide. To say that we were pleased is an understatement. Everything from the beginning to the end was professionally facilitated with Duke as the leader and the ship's manager and staff in full blown "we are here to welcome and please the guest" mode. Our room on the ship was wonderful (request the premium room at the bow of the ship is it has a balcony, seating for four and great views). The food was delicious and the service was exceptional. The Amazing Caves on Halong Bay were breathtaking. We are appreciative of everything this tour provided. Highly recommend the company. A beautiful boat with great itinerary. Super staff. You are very lucky if you have Luca with all his information as your guide. Wake up early to do Tai Chi. Caves a complete bumfight and not essential viewing!